Below is a description of the elk hunting available with Colorado High Country Adventures. Whether you are interested in pursuing elk and mule deer in the high country of western Colorado, or mule deer, trophy bull elk and antelope on the plains of Wyoming we can accommodate you. Our 500,000 acres of private land hunting in Wyoming with classic western accommodations in beautiful knotty pine cabins. Unguided drop camps are available in Colorado. Please review our hunting locations and let us know what type of hunts you are interested in. The White River valley east of Meeker and Buford is home to the Flat Tops Wilderness Area of Colorado and the largest elk herd in the United States. 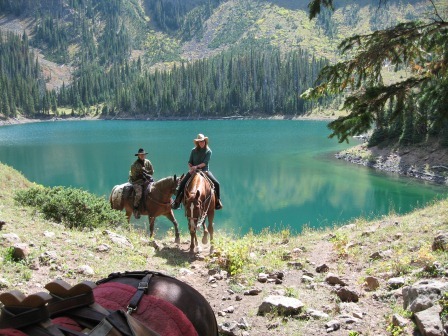 Here we offer guided and unguided hunts in the Flat Tops Wilderness and adjoining White River National Forest. Guided hunts are staged from the ranch with comfortable accommodations in modern cabins, or from tent camps. Drop camp hunts are from remote, pack-in tent camps reached via horse. The wilderness designation means no motorized vehicles of any kind are allowed in this beautiful, pristine area. Including the ranch, the hunting area available includes aproximately 100 sq. miles of back country in the White River National Forest east to Trappers Lake and on both north and south sides of the White River. This vast country offers clients a very broad range of hunting opportunities ranging from 8,000 ft elevations to 11,000 ft high in the wilderness. Elk can be found throughout the area, and by having lots of excellent habitat to hunt we can find the herds and offer you an excellent opportunities to see and encounter elk. Guided hunts are limited to six hunters per week with 2X1 the standard guide to hunter configuration and 1X1 hunts available. 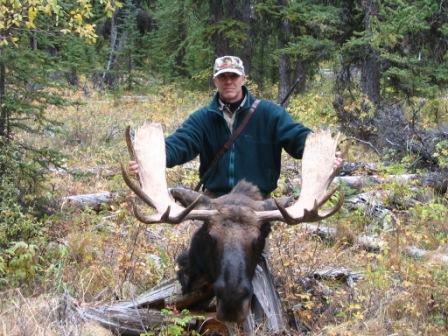 The guides have all worked up here for years and have an excellent knowledge of elk hunting and the country hunted. They are professional, experienced back-country woodsmen and know how to handle horses. This part of Colorado has lots of elk and good trophy quality as the White River herd has improved in recent years. Each year we take many average for Colorado elk and lucky hunters take some really good 6X6 bull. The hunting is good starting in September when resident herds are reached by horse and right through the late rifle hunts when the elk began their migration north and west to the lower high-country desert wintering areas. Guided day hunts are also available to those hunters visiting the area who may wish to hunt on their own for a few days yet take advantage of a day guide for a day or more. Please inquire about this program. This is a draw area for archery, however the odds are good even for hunters with zero preference points. What makes this area excellent for elk archery hunts is that because we have lots of elk the opportunity to encounter animals exists every day of the hunt. We have many drainages to hunt, dark timber for when the weather is warm and we know where the elk wallow. Shot opportunity usually is well over 50% which is outstanding for archery elk. Complete ready to hunt from drop camps or pack service using your own equipment are available and can be set for up to 10 hunters with a four person minimum. Hunters that are in good shape will have an advantage of course at high elevation. We will ride into each camp every other day to check on you for safety purposes, any needed supplies or to pack out animals. Unguided hunters need to be prepared to field ready their killed elk into game bags and to move the elk if necessary to a spot where we can get horse access. We'll do the rest from there. Average costs: Guided 2X1 hunts are $4400. Self Guided Base Camps: We have complete ready to hunt wilderness base camps at $2150 per hunter based on a 4 hunter minimum per camp. 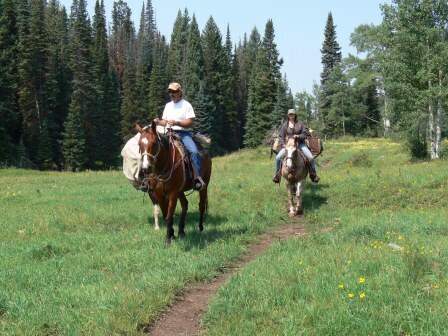 The camps are located high up and well back into the Flat Tops Wilderness and are reached by horse. These are high quality, fully furnished camps and the rate includes game packing and nightly radio checks at night. The is a property that consists of 2,200 acres of private land, surrounded on three sides with very limited access to 7,000 acres of B.L.M. land and approximately 10,000 acres of U.S.F.S. It is located south of Pikes Peak and features a long narrow valley with excellent grass and timbered ridges rising up from the valley floor. There are some real good mule deer here along with elk. Accommodations are in a beautiful and rustic, fully restored turn-of-the-century mining camp hotel with five bedrooms, parlor with player piano, large dining room, excellent wood fired heat, bath & shower on each floor, extra long beds and a front porch overlooking a trout stream and pond and occasionally, grazing elk. The hotel was brought (in pieces) by buckboard from a mining camp location several miles south of the Ranch around 1910. This is a 1st class operation with comforts not found in most outfits where you will sleep comfortably, have indoor facilities, enjoy good food and beverage and an occassional cigar. We hunt by foot or vehicle access depending on which part of the country we need to reach each day. We have a varied hunting area, some is secluded, rough and steep and other parts of the ranch are much more forgiving and accessible. Elk and deer may be encountered on all parts of the property. Success has historically been around 30% for archery and close to 50% for rifle, which is well above the Colorado average. There is a year-round stream which provides a wonderful change from hunting as the trout are unpressured and sometimes not too wary so that you might even catch your dinner! Average costs: Guided hunts average $5165 rifle and $4550 archery. Prices do not include the cost of hunting licenses and are subject to change. We hunt the mountains in the north end of the San Luis Valley and have elk hunting available on over 50,000 acres of private land. 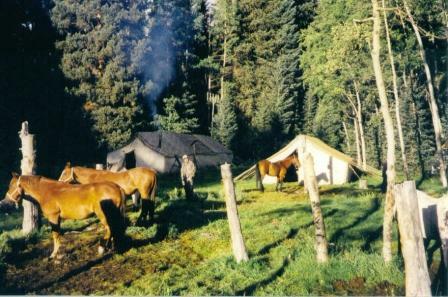 Wilderness hunts are based out of full-service tent camps reached by horse and are located 5-8 miles from the trailhead. Archery, muzzleloader and rifle hunts are all good. Hunters need to be in good physical condition to get the most out of these hunts, but we are in the middle of excellent country and elk can be found anywhere on any day. Private land hunts are on large ranches where we access the properties by 4WD and hunt by spot and stalk. These ranches are in an agricultural area (see picture below) and herds of elk move around the valley in search of the best alfalfa and crops and we hunt according to game movement. Licenses are available via land-owner vouchers with liberal hunting seasons starting in early July and running into December. The early hunts will enable you to hunt elk still in velvet. You will stay in the ranch house and we will drive out to hunt each morning. If the hunt is unsuccessful we will leave the elk during the day and return later in the afternoon when they again get up and move to feed. These hunts are fair-chase, but come with the highest possible success rates often approaching 90-100% shot opportunity and kill. 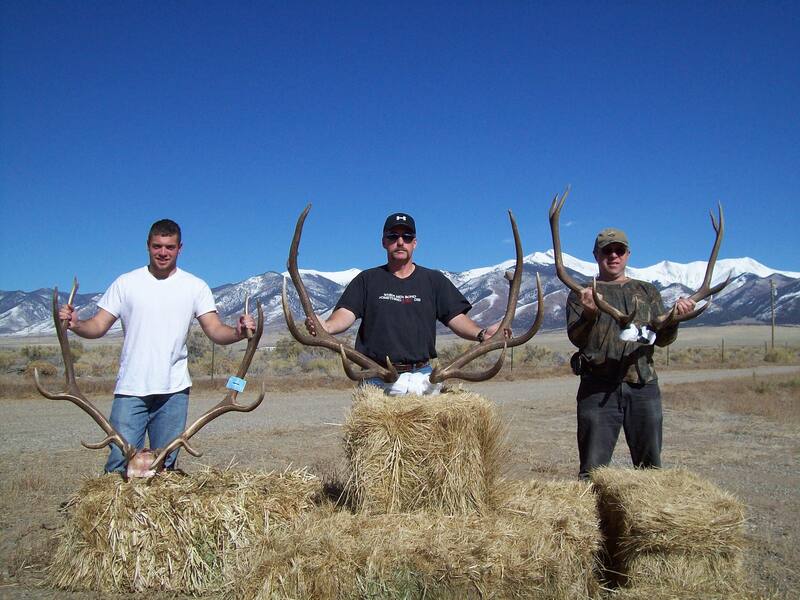 Many elk will be "average" Colorado bulls, but we do take some real trophies with scores well over 300 inches. Our trophy hunt held the first week of September is for bulls in the 340-380 inch range. Average Costs: Public Land Wilderness Hunts are $5000 guided and $2500 for drop camps. Private land hunts are fully guided and prices vary by ranch. Please call pricing. Hunts do not include the cost of the necessary Colorado licenses. We will provide you with the landowner voucher needed to purchase the private land license. These hunts fill up each year, so if this type of hunt is of interest to you please call right away. Offering trophy archery, rifle and muzzleloader hunting on private ranches located in plains units near Colorado Springs or mountain units around Pikes Peak. Trophy elk hunting on ranches where a 330" bull is what we are after. Mule deer hunting is outstanding with trophy quality buck in the 28"-30" range taken yearly. Mature antelop bucks on on all ranches. This is a small hunting concession where we'll host approximatly 2-3 hunters most weeks. Success is high. Average costs: Guided hunts average $5500-$6500 for elk, $6500 for mule deer and $2000 for antelope. Some ranches have land owner vouchers and other hunts you will draw the license. "Serving big game hunters since 1994"